The sacred treasures of the monastery have been stolen! While simple greed could explain the theft of the eyes of the dragon, the Grandmaster of the Dragon path has sensed a more sinister motivation for the theft that has come to pass. 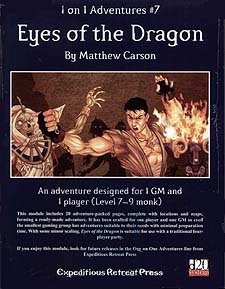 Far beyond the walls of the remote monastery, you must journey into foreign lands and battle the will of an ancient foe to recover the eyes of the dragon. Requires the use of Dungeons & Dragon, Third Edition Core Books.